Today marks the first post of my new Blogging and Beyond series. My intent is to offer a behind-the-scenes-glimpse into the lives of some of my favorite bloggers, and to hopefully learn some more about blogging. Here's to summer and good blog reading! The first blogger we'll be getting to know is Julia from Hooked on Houses. Her tagline says it all. If you have a love affair with houses, this is the blog for you. Julia showcases everything from Bad MLS Photos to Celebrity Homes to Beautiful Makeovers and all sorts of other fun features. She has a wonderful sense of humor, and I am forever grateful to her for introducing me to the genius that is Downton Abbey. She also takes time to answer reader questions, and I'm always appreciative of her input. I had been working as a freelance writer since college--mostly magazine articles and textbook projects. It was a great gig (I could work from home and be with my kids), but I was getting really burned out by the end of 2007. I was working long, crazy hours to research and write about topics that weren't always that interesting to me. So, in January of 2008, my new year's resolution was to find a way to write about something just for fun, and just for myself. I was trying to sort out what that would be in my journal and wrote, "I'm hooked on houses, so I should start a blog and call it that!" It was like a light bulb went off. I walked straight to my computer and started HoH, without having any idea what I was doing. I had never seen a design blog. Ever. I had no idea they existed. 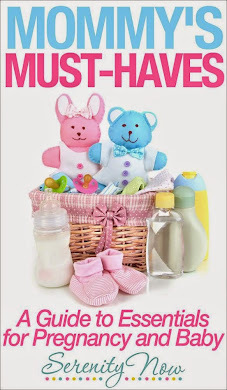 I had been reading blogs for writers and moms, but not for house lovers. Imagine my surprise to discover that there was an entire community out there of people like me! What makes me stick with it? Not being able to stop. I love it! In January of 2010, I stopped accepting outside writing projects and became a full-time blogger. It's my dream job. Write as if the whole world is reading. In the beginning, I had no idea anyone but friends and family would be looking at my blog. I had all kinds of personal information and photos on there because it never occurred to me how public my forum would be. I had only been blogging for about a month when I mentioned two of my favorite authors and they both sent me very nice emails, thanking me for mentioning their books. This is how I learned about Google Alert! Turns out if you write about someone, they will probably get that alert and see it (so watch what you say--ha). Three months into blogging, I was mentioned in the London Guardian newspaper as a "Blog to Watch." Suddenly I had hundreds of new readers from the UK. It blew my mind. You really never know who is the world might be reading! 3. Is there a Feature/Series from your blog that you could call a favorite? I personally get a kick out of the Funny Real Estate Photos because the reader comments on those are always hilarious. Readers send me so many contenders for that feature each week that I can't use all of them on my blog, so I post the extras on my Facebook Page. I love writing about the TV and Movie Houses because I'm kind of a research junkie who likes to track the information down. But by far the most popular posts are about Celebrity Houses. People can't seem to get enough of seeing where the stars live! I love to read. I go to every author reading I can and have collected their autographs over the years. I have my favorite autographs--like those I got from Sophie Kinsella, Madeleine L'Engle, and Elinor Lipman--hanging on the wall of my office. Now that I'm reading house/design blogs every day, I don't pick up as many shelter mags as I used to. My must-have magazine is actually Entertainment Weekly. I'm a total entertainment junkie, which you can probably tell if you read my blog. I love that EW is informative, fun, and has a sense of humor--three things I want Hooked on Houses to be! Using our new sunroom, which we built over the winter. We love it out there! Pics are here. 7. How has adopting a dog changed your family? 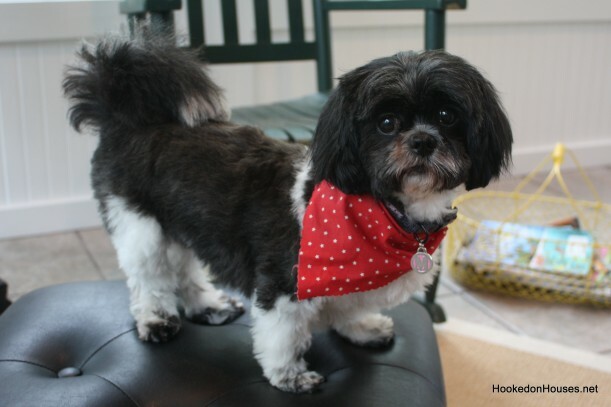 We are all so in love with Maizie, our little black and white Shih Tzu, it's crazy. When we adopted her in January, she was in bad shape (starving, with a broken jaw), so it's rewarding just to see her becoming so healthy, happy, and strong. 8. Do you have a favorite house style? Beachy. I feature a lot of beach houses on my blog because that's what I'm always drawn to. I would love to have one of my own someday! 9. If you had to choose one celebrity home to live in, which one would you choose? 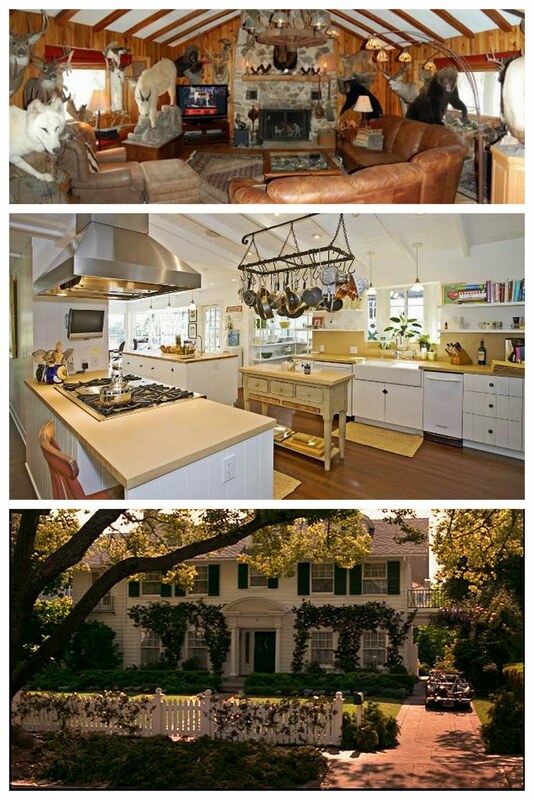 I love Reese Witherspoon's retreat in Ojai, where she married Jim Toth earlier this year. 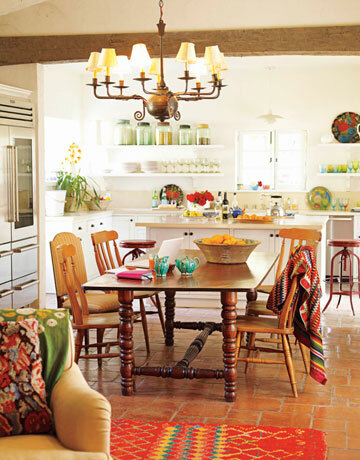 I especially liked how colorful it was when designer Kathryn Ireland lived there. Chocolate. Hands-down. I never, ever skip dessert. What I do aim for is to make the most of those times when I don't have any distractions (read: kids). When they're here and want something from me, I try to get up from the computer and give them my full attention as quickly as possible so they don't feel like blog orphans. Yesterday my daughter Lily asked me to play about a dozen different board games with her, and I spent the afternoon doing just that instead of finishing the post I planned to work on. It meant a late night of catch-up for me after the kids were in bed, but it was worth it to have that time with her. I definitely have to be more flexible in the summer when school's out! Thank you so much, Julia, for being willing to take the time to share with us! I hope you'll stop by Hooked on Houses to get your house fix. Please be sure to tell Julia I sent you. Please come back tomorrow to link up YOUR best post of the week to Weekend Bloggy Reading. Recipes, crafts, home decor, book reviews, funny stories, you name it. 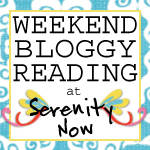 Come prepared to showcase your blog and find some great weekend reads. Julia is one of my favorite people in the blogosphere. As you know, I love to read good writing, and Julia's is the best. It's amazing how good her writing is. Back in the day when most writing was done by professionals, I think her writing would have been well above average, but perhaps hers wouldn't have stood out quite so much. Today, though, her writing is just the best--a true pleasure to read. In addition to being such a good writer, Julia is just a lovely person. She is unfailingly kind and so very encouraging. I respect her greatly, and I just plain LIKE her! This is a neat idea for a series, Amanda! Your questions are good, and these will be great fun to read. Thank you! Amanda, I can already tell I'm going to LOVE this series. Now I'm off to subscribe to her blog! Great series Amanda! I can't wait to read more. Thanks for your hard work in putting this together! Hope that Julia's dream of a beach house will come true!!!! Great series, Amanda!! Also, I just learned about Google Alert! So much to learn still, even after two years of blogging. What a great series!!! So fun to read about other bloggers and how they live and the dreams they have! This seies is going to be so much fun! I've looked at Julia's blog a time or two, but after reading this interview, I realize that I need to become a regular reader. You come up with the greatest series!! Thanks for showcasing Julia and her blog...I am now a subscriber and can't wait to spend way more time than I need to reading her blog!! What a great new series! Julia is new to me so thank you for the great introduction! I can't wait to meet all your favorites!! If Julia knew how many times I have typed in hookedonhouses.net, she would take out a restraining order! I wrote my very first post about Julia and her blog. Another great series Amanda! I now have a new blog to follow. Thanks for featuring Julia and Hooked on Houses. I love it! So nice meeting Julia and hearing of her blog. I must go visit! Great post! I'm so happy to have found both of your blogs. Thanks!